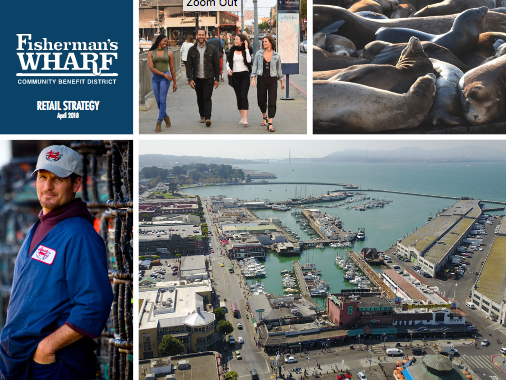 Fisherman’s Wharf Retail Strategy Released! 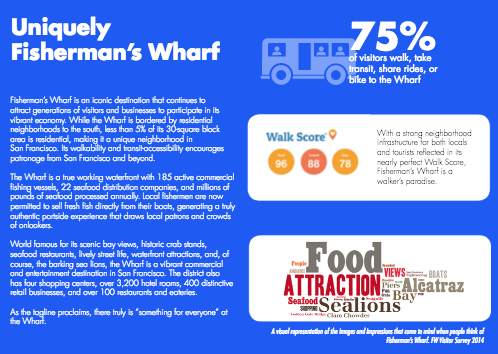 The Fisherman’s Wharf Community Benefit District (FWCBD) unveiled a new district Retail Strategy for the 30-block historic San Francisco waterfront neighborhood. The Strategy is a renewed effort to strengthen the district’s commercial mix, celebrate the area’s fishing industry, and create new interest in the area from both local residents and visitors. The comprehensive document focuses on business, entertainment, appearance, safety, marketing, and the public realm. A year-long collaboration between FWCBD staff, Seifel Consulting, lowercase productions and the Retail Strategy Task Force, the Strategy comes packed with statistics and input from visitors and local stakeholders---including businesspeople and approximately 6,000 neighborhood residents. The Strategy examines opportunities and challenges facing the District, and concludes with recommended action steps, with a particular focus on priority actions for the next two years. Founded by businesses and property owners in the Fisherman’s Wharf neighborhood in the mid-2000s, FWCBD has worked tirelessly to foster relations between City agencies and the District neighborhood and community groups. A 501(c)(3) non-profit organization, FWCBD is funded through an annual property assessment on the land side and a gross sales assessment on the Port side. 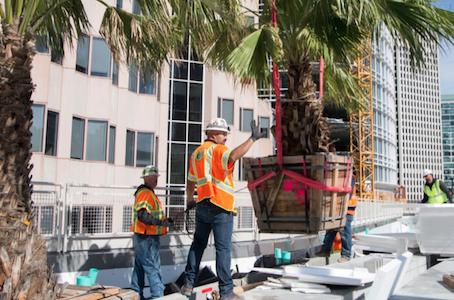 The transformation of San Francisco’s waterfront, and the many exciting opportunities and challenges it presents–was the focus of Leadership California’s July 20th afternoon program. As part of their yearlong California Issues & Trends Program (CIT), women leaders from across California gained insight from San Francisco women who are leading major development projects along the waterfront. Rebecca Benassini from the Port of San Francisco started the presentation by providing an overview of the catalytic projects stretching from north to south along the City’s seven miles of waterfront. 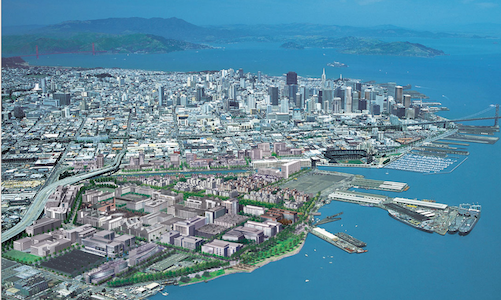 Nadia Sesay of the Office of Community Investment & Infrastructure (OCII) described the innovative public private partnership that OCII is undertaking with Five Point at Hunters Point Shipyard and Candlestick Point (The Shipyard). Ivy Greaner of Five Point described the key development components of both The Shipyard and Treasure Island that Five Point is currently implementing. Anne Taupier of the Office of Economic & Workforce Development described the key negotiating principles that have provided the framework for innovative public private partnerships at Mission Rock, Pier 70 and HPS/CP to enhance transit access, create housing affordable to a broad range of local residents and workers and provide new parks, artist studios, maker space for local artisans, and small business and employment programs for local residents along the southern waterfront. Libby Seifel, an alumna of the Leadership California program, moderated the panel and led an interactive discussion on lessons learned and best practices regarding on how to create successful public private partnerships that transform communities while addressing key community goals. OCII staff then led CIT women on a dynamic tour of the new neighborhood that is being created at The Shipyard. Leadership California is a network of accomplished women who are dedicated to advancing the leadership role that women play in impacting business, social issues and public policy. The CIT Program brings together a diverse group of women from a broad range of sectors, ethnicities, regions and professional backgrounds. Click here to view Mark Hogan’s presentation! Click here to view Libby Seifel's presentation! For over 100 years, the Japantown neighborhood has been the cultural heart for the Japanese community of San Francisco and the Bay Area region. At the same time, Japantown has endured numerous challenges to its physical and economic environment. 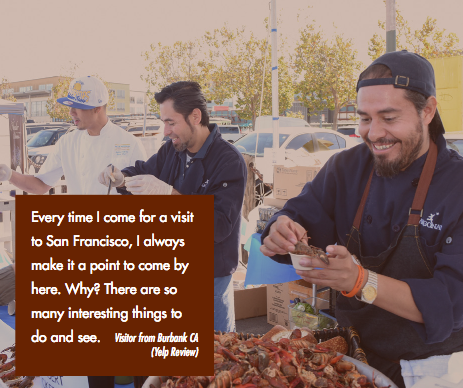 Over the last four years through San Francisco’s Better Neighborhoods planning process, community stakeholders have articulated their vision for Japantown’s future and recommended cultural and economic strategies to achieve this vision. The Japantown Cultural Resources and Economic Sustainability Strategy (JCHESS) is the result of this process to articulate community concerns, identify cultural resources in the area, and deploy public policies and funding tools to preserve and enhance cultural assets. The upcoming 1/28/14 SPUR forum will present JCHESS, the first of its kind in the nation. 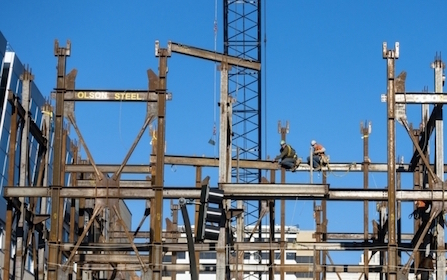 Hear important lessons for other communities within San Francisco and beyond. 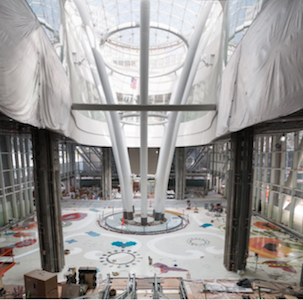 Seifel Consulting served as economic consultants assisting the City in creating a compendium of economic and other tools to help support the preservation and enhancement of cultural resources. Details on the SPUR session located here.